In a large mixing bowl, stir together cookie crumbs and butter until well combined; pat into bottom and up the sides of a 9-inch pie dish. Bake for 10 minutes. In a large mixing bowl, using a mixer on high speed, beat 1/2 cup cream until stiff peaks form - about 2 minutes. In a large mixing bowl, using a mixer on high speed, beat egg whites (reserving egg yolks) and cream of tartar until very foamy - about 3 minutes. Beat in yolks, melted chocolate, peanut butter, 3/4 teaspoon vanilla and salt until well combined. Beat in whipped cream until combined. 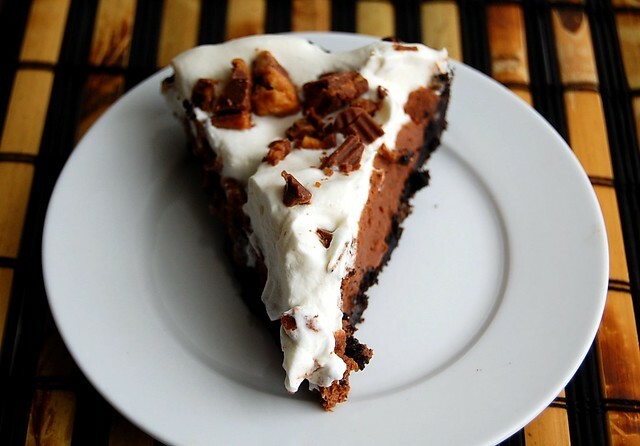 Place peanut butter-chocolate mousse into pie shell. In a large mixing bowl, using a mixer on high speed, beat remaining 3/4 cup cream, remaining 1/4 teaspoon vanilla and sugar together until stiff peaks form - about 2 minutes. Spread whipped cream over pie. Sprinkle with chocolate peanut butter cups. Chill pie for at least 1 hour before serving. 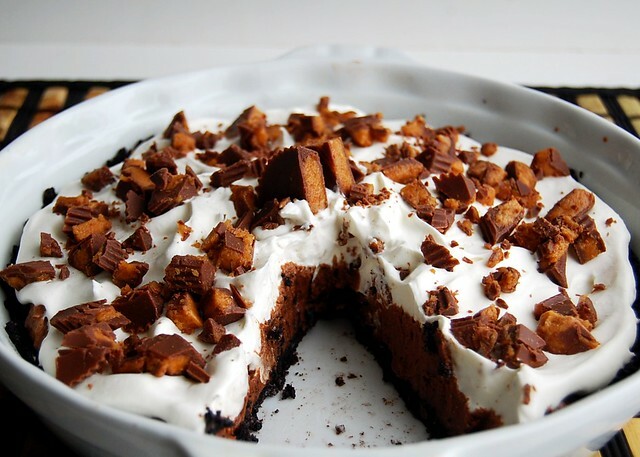 31 comments on "Peanut Butter Cup-Chocolate Mousse Pie"
Oh my gosh this looks divine! And I didn't know about Safest Choice!! Thanks for the new info! 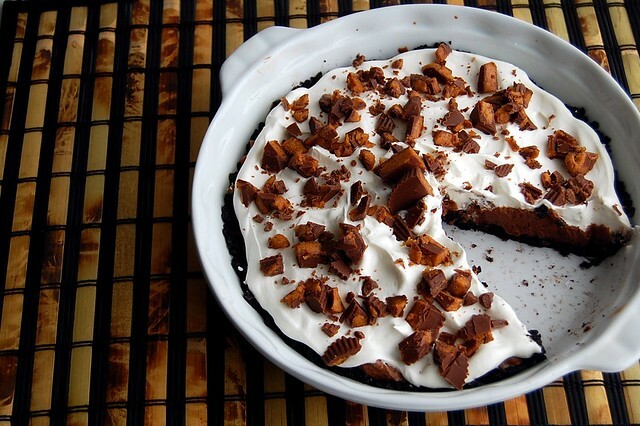 What a delicious-looking pie. I am making chocolate mint cookies per the request of my hubby. We're not big on Valentine's Day stuff, we stayed in, had a nice meal at home, and relaxed in our PJs. I remember waitressing Mother's Day Brunch where I worked - ugh. I can only imagine Valentine's Day. Whew. Dang girl! You knocked it out of the park with this one. Can you take that slice for yourself and give me the rest? So what happened to the oreo cookie middles? I would probably eat them. I love the idea of this pie. I myself am not afraid of raw eggs. Too many years of eatingg raw dough and batter hehe. yay i'm so glad i read this post! my roommates are always buying 'P' eggs and i have no idea why they have that tattoo and now i know! yay! Oh my that looks delicious. I'm sure you and Eric will be enjoying it happily together. I guess no one likes V-day on a Monday? I had to celebrate over the weekend by default because tonight is dance class night. We chose a local restaurant. It wasn't crowded (I guess it's not the most Valentiney place in town) but there was some crazy old lady in there who wouldn't stop complaining. She made everyone in the restaurant miserable. Mmmh chocolate mousse in pie form... looks great! Wow this looks stunningly amazing! Delicious!! Yum! Kinda like French Silk Pie but hopped up with peanut butter! I never could find P eggs in Kansas and can't here in Utah either. Guess I just need to ask in the right places and some free ones will show up. I miss HyVee and Dillons here in Utah. Yay for safe eggs! I need to be on the lookout for those because with all the batter I eat...I'm bound to get salmonella sooner rather than later. My birthday is coming up and I think I need to bake this for myself. Yes. Definitely. ooh, yum. will you be my valentine? happy valentine's day! do you deliver?? Just kidding! Hope you and eric-cakes are doing well. Wait, am i allowed to call him that too? perhaps not. :) wishing you guys well! and thank you for the deliciousness you never fail to provide. That is a perfect valentine's day dessert!! If I wasn't doing a vegan challenge this week, I would be making that tonight! This looks like a perfect indulgent treat! I love the mousse cloud-like texture. Ps. I totally agree - baking over serving would be fun. 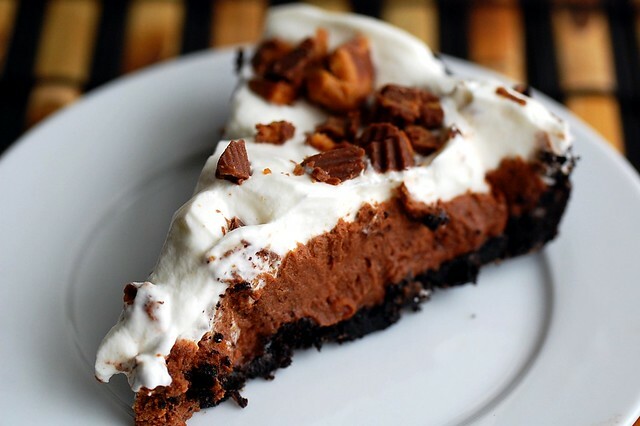 Seeing as peanut butter & chocolate are two of my closest friends - especially when paired together - I know I could face-plant myself into this pie and be completely happy :). Well done! Wow, that looks tasty...can't go wrong with pb cups. I made a peanut Butter Cup Cake last year and it was divine. 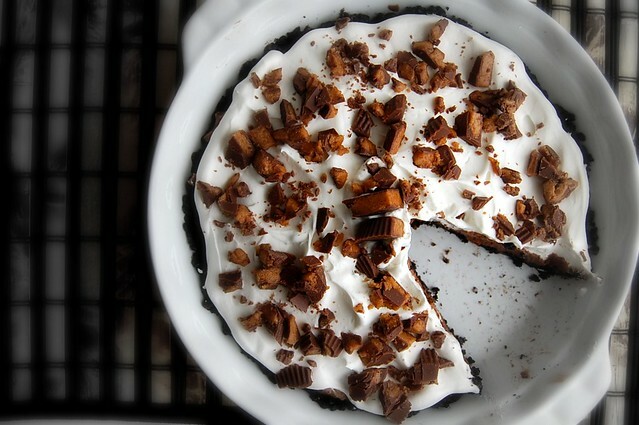 Now I need to make this pie! Sherry, they're in the crust! Rachel, that old lady sounds awful. Those chocolates look divine! I've never seen them before. Orange dress, you can make it work. nice find! thank the god above everything worked out like that--this pie is phenomenal! YUM! I made this over the weekend... it was Amazing! Moon and Linda, so glad you liked it! That makes me happy! I don't know how you know exactly what is the essence of deliciousness....oh my jeeez I want some of that pie!